Canned fish: it’s more than an emergency dinner when you don’t have any other protein in the house. It doesn’t get a lot of attention in recipes, maybe because it’s just not very photogenic – fresh fish is more impressive to look at. But if you’re more interested in eating your food than taking pictures of it, canned fish is hard to beat as a source of affordable, convenient, and nutrient-dense Paleo protein. And yes, it can even be tasty! On the other hand, don’t just grab the first can you see on the shelf. 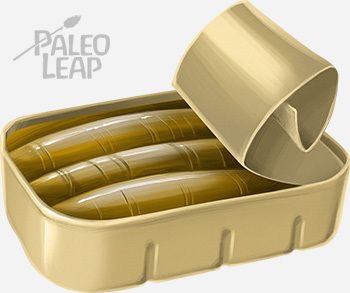 The canned fish aisle is a minefield of industrial seed oils and hidden soy products, so it’s important to read the labels to make sure your “Paleo” protein isn’t hiding anything gross. Here’s what to look for, what to avoid, and what to do with your fish once you’ve got it. Not all canned fish is created equal! Obviously, if you’re eating Paleo, you’ll want to avoid the snack packs with tuna and crackers in them. But even a can of plain fish can have some problems. Industrial oils. Take a very close look at the ingredients list, not the front of the package. Sometimes, the front of the package will say “olive oil,” but the inside actually contains some olive oil mixed with some canola or soybean oil. Hidden soy. Look at the allergy statement on the nutrition label (the line that says “contains egg, milk, and soy ingredients” or whatever list of major allergens the product contains). Soy can sometimes hide inside “broth” or other items on the ingredients, so if you’re sensitive to it, check the allergen warning. Other junk. Be very cautious about fish canned in mustard or tomato sauce or anything else – sometimes it’s OK, but often it involves a whole pile of junk ingredients. If you want mustard or tomato sauce on your fish, you can always put it on yourself. Now here’s what to go for, if possible. Bone-in fish. Sardines, bone-in salmon, and bone-in mackerel are all common examples. Bone-in fish is a great Paleo source of calcium. Wild-caught, sustainably-harvested fish. It’s not just more sustainable; it’s also more nutritious. Canned salmon is almost always wild-caught. Fatty fish. Fatty fish includes salmon, mackerel, and sardines. These species are more flavorful than very lean fish like tuna, and they’re also more nutritious because you get a bigger dose of Omega-3s and Vitamin D.
The above is a list of nice-to-haves. You don’t need any of those things for your fish to be Paleo. For some people, paying extra for sustainably-raised fish just isn’t an option, and that’s OK. You can still do Paleo with the $0.75 cans of tuna in water from Wal-Mart. But there are several different brands of canned fish that address those concerns and they’re worth checking out. Basically the difference is in the species. Some species of tuna are bigger than others. The bigger the fish, the higher it is on the food chain, and the more chance it has to accumulate mercury from all the other fish it eats. On the other hand, smaller fish are lower on the foot chain, so they don’t accumulate as much mercury. That’s also why sardines and shrimp and other small fish rarely present mercury problems. Canned salmon is rarely high in mercury. The larger a fish is, the more chances it has to accumulate mercury, so if you’re worried about mercury toxicity, smaller fish are your best bet. If you go through a lot of fish, it might be worth it to order online – it’s easier to look up information about packaging and ingredients, and there’s a bigger selection than most people have locally. And if you’re interested, it’s actually pretty easy to can fish yourself at home. The big problem with canned fish – especially fish canned in plain water – is how to make it taste good. Some people are happy to eat it straight out of the can, with nothing or just with a little salt and pepper, but it’s perfectly reasonable to prefer something slightly more sophisticated. Here are some ideas. You can add canned fish to almost any combination of greens and dressing that you like. In fact, canned fish is a great lunchbox salad topper because you can keep it separate from the greens until you’re ready to eat and then just throw it on – no need to worry about refrigerating your protein or the greens getting slimy. These recipes make canned fish into a “real” main course for dinner, so you don’t feel like you’re just eating out of the can. Tuna casserole – no noodles, but you can make Paleo variations in a variety of different ways. Try this one with zucchini “noodles” (Primal bliss Nutrition) or this one with spaghetti squash (Primal Dish). Curry – canned fish is an easy way to add some protein to a curry. You could use this recipe for curried shrimp and spinach, and just replace the shrimp with any kind of canned fish that you like. With eggs – you can cook any kind of canned fish into an omelet or frittata, and it gives the whole dish a nice flavor boost. Sardines with eggs are also great for breakfast – try poaching both in a pot of tomato sauce. What’s your favorite recipe for canned fish? Got one to share? Let us know on Facebook or Twitter!